I have a short bob about a half a inch below my ears and I was wondering if micro loop hair extensions would be good. In my opinion micro loop hair extensions are still too big and visible for shorter hair or those with thinner hair. Beads are not always in same color as natural hair and some of them are quite thick even when clamped flat! Hair is looped through the beads and clamped using pilers. Quality is important! If beads not clamped firmly, hair can slip down and then you have to fix it again. On the other hand, if beads are made of hard material, it can be damaging to hair shaft. Most of those Micro beads are made of soft silicones and they must be maintained using some sort of silicon-based serum to keep it from drying. But lest also be fair. 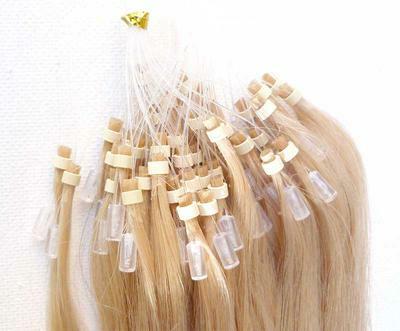 Micro loop extensions are very convenient and cost effective. They are easy to apply and easy to fix. I suggest you find a quality brand and then ask your stylist to attach only a single or perhaps two strands. Wear it for few weeks and see how it feels.